I had 1/2 cup sweetened condensed milk left over after doing another recipe of Dark Chocolate Gelato and had a bottle of Brugal Titanium Rum sitting on the island. My mind began to work on how best to combine them. As much as I like Bailey’s Irish Cream, it pales in comparison to the memory of a delicious rum cream I had many, many years ago. A web search turned up a lot of recipes, none of which appealed, as I didn’t want to add eggs, coffee or another liquor. So I took parts of several recipes and created my version of Rum Cream to which I added Hershey’s chocolate syrup because, why not? Combine all ingredients in a blender and mix. Scrape down the sides of the container and mix again. Keep chilled until ready to serve. I was dropping off my taxes on Magazine street around lunchtime, so I stopped at Stein’s Market and Deli. They’ve got retail shelves of vinegars, jams, crackers, spices, salts, etc. They have a large selection of beers and sodas from all over and a good selection of gourmet bitters. They sell meats, cheeses and have bagels flown in from New York. I was there for a sandwich. You order at the end of the counter and I went for the corned beef on rye. They make sure the sandwich is to your specification including seeded or unseeded or marbled rye, type of mustard, and if you want your meat cut from the fatty or the lean end (I opted for fatty). The sandwich is thick, piled high with meat and comes with a slice of half sour and a slice of full sour pickles. They added extra pickles for me so I had some with every bite! They’ve got tables set up inside and outside so you can enjoy your food there or, be like me, and take it home with you. If you’re ordering beer, you’ve got to go somewhere else to drink it as they’re just retail for alcohol. The guys at the counter and making the sandwiches are super busy but they’ve always been friendly and helpful to me. They can also be irreverent and a little crass but that’s the sandwich business. I definitely recommend a visit there, especially when you’re craving deli food. Oh, and their matzo ball soup is terrific, too. I didn’t order any this time but the last time I had a cold I went in for some and it sped the healing up! I look forward to Easter because it gives me an excuse to dye eggs which in turn gives me the perfect reason to make lots and lots of deviled eggs. I like to add a whole avocado to turn the eggs slightly green. Besides tasting awesome, so many people have been conditioned against green eggs by Dr. Seuss that it means more for me. Peel eggs. Slice in half and gently remove the yolk to a small bowl. Reserve the whites for filling. Mash the egg yolks and avocado with a fork in a medium bowl. Add mayonaise, mustard, pickle juice and hot sauce. Sprinkle on salt and pepper. Stir to combine. Adjust mayo, mustard and seasonings to your taste. Use a piping bag or a spoon to mound the egg mixture into the egg whites. Sprinkle the tops lightly with paprika. If not serving immediately, add a little lemon juice to the recipe to keep the avocado from turning brown. Wrap plastic wrap over the eggs and store in the refrigerator for up to 24 hours. Rainbow desserts to be precise! 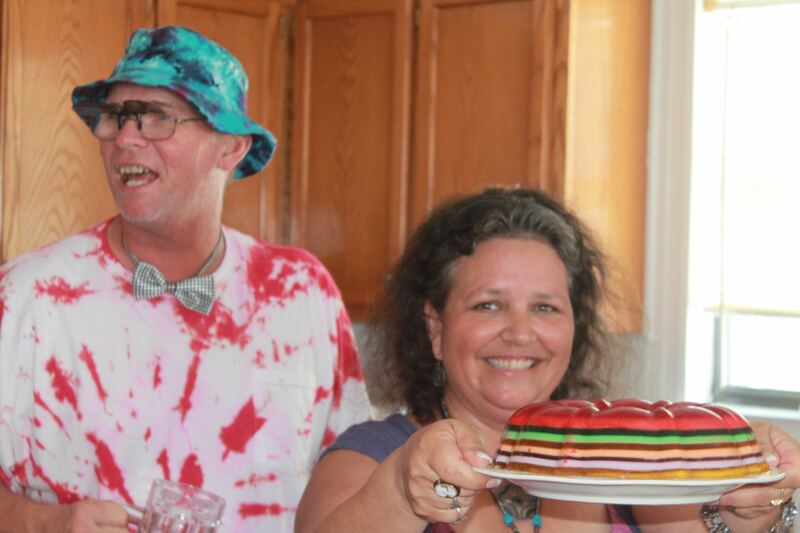 Wayne and Kathy and their tie-dyed wedding reception! 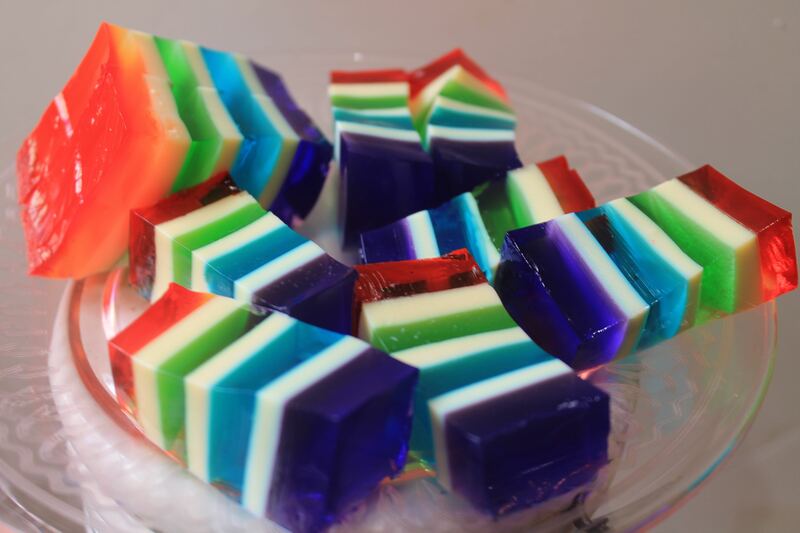 All that conversation made me want to make something festive this Easter weekend and what could be better than edible rainbows? And, what can make it even easier to endure a holiday than a spirited dessert? You can put alcohol in each layer but I’m not in college anymore and so I only put it in the white layers. 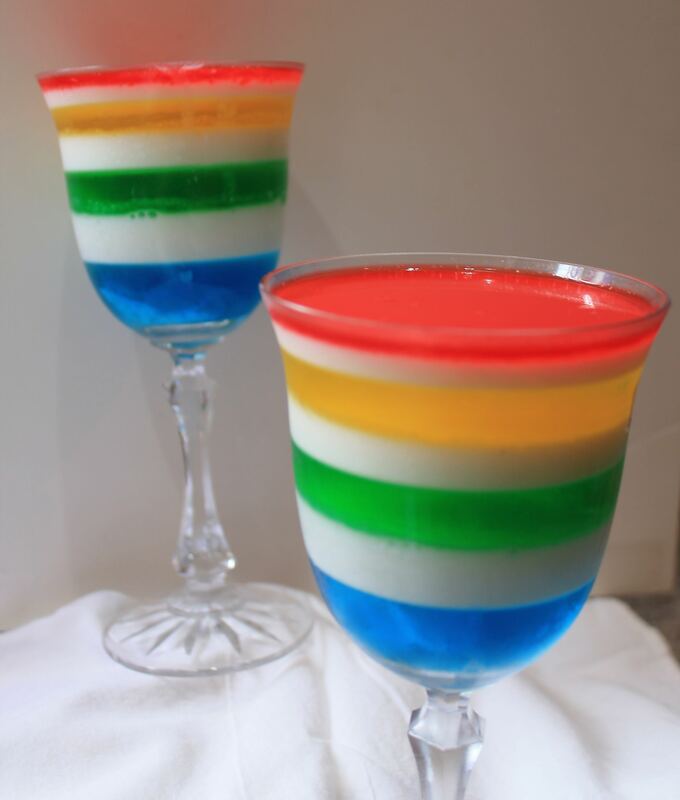 Adultify your rainbows by adding 1/3 cup vodka to the gelatin/yogurt layer and reducing the second amount of hot water by that amount so you are adding 1/2 of liquid. Also, if you want it sweet rather than tangy, use 1/2 can of sweetened condensed milk in place of the yogurt (you will get four layers of white out of one can). Make it in two batches, though or the white layer will gelatinize before you use it. The top picture shows the ones made with greek yogurt and the bottom one with sweetened condensed milk. Mix 1 package of any flavor gelatin according to the package directions. Typically, that is one cup boiling water added to the gelatin. Let sit a minute before stirring for three minutes and then adding 1 cup cold water. Pour into a dish or glasses. I use an 8×8 glass casserole dish if I’m making squares or you can use around six to eight pretty glasses. Refrigerate until set, which gives you about 30 minutes before you can move on to the next layer. Mix 1 envelope unflavored gelatin with 1/2 cup hot water and stir until dissolved. Add 1 cup Greek yogurt and an additional 1/2 cup hot water. If you want to include booze, add 1/3 cup vodka to the measuring cup and pour in enough hot water to bring it to 1/2 cup liquid. Stir well to make sure it is well combined. Cool slightly before pouring half (just enough to cover the gelatin and make a thin layer) of the yogurt mixture over the set gelatin and refrigerate until firm, about 30 minutes. Leave the remaining gelatin/yogurt on the counter until after the next color layer. Repeat the first step with the next color. Continue, interspersing color layers with white layers until done (or you run out of space in your vessel). I did mine starting with blue, then green, then yellow, then red (reverse Roy G Biv). For the cubes, I started with a violet layer. These are best made the night before to help the layers bond to each other. 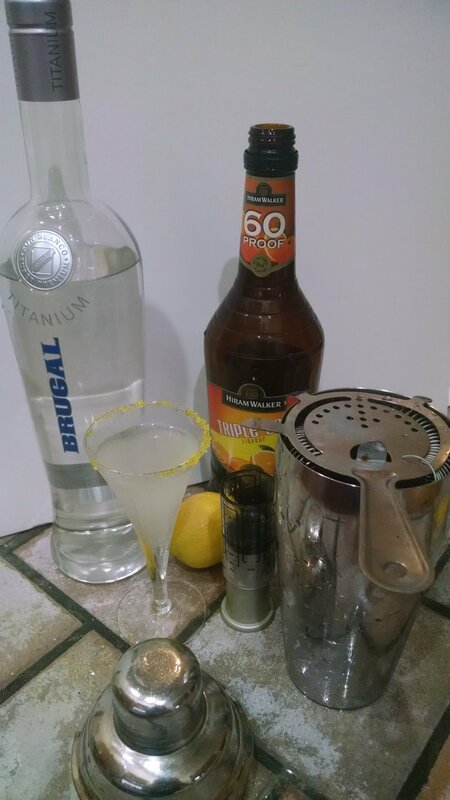 My friends, Charlotte and Thomas, brought me back some rum from the Dominican Republic and I had some lovely lemons just begging to be used, so I made a version of the Sidecar. Very bright and perfect for the warm, humid evening! If you find the drink a little too tart, add a tablespoon of agave nectar to the shaker to sweetening things up. Rub the rim of a chilled cocktail glass with lemon juice and dip it in sugar. Shake the rum and other ingredients well with ice, then strain into the prepared cocktail glass. You may need to slightly adjust the amounts of triple sec and lemon juice, depending on the brand of rum you use. This recipe comes from the late Barbara Tropp, chef/owner of the China Moon Cafe in San Francisco, author of several cookbooks and the Mother of Fusion Cooking. She died in 2001 from ovarian cancer. Lemon ice cream awakens the taste buds. Preparation of this version is very simple as there are no eggs or cooking involved and it just takes a spin in the food processor to get it ready. The original recipe called for 1 1/8 cups lemon juice but I found dividing that in half didn’t make it lemony enough so I bumped the juice up to 2/3 cups. Wash lemons and remove skin with a sharp peeler, taking care not to remove the bitter white pith. Peel as many lemons as needed to obtain 2/3 cups juice. Put the peel and sugar in a food processor and process until the sugar is slightly liquid, about 3 to 5 minutes depending on the sharpness of the steel blade. Pour in the lemon juice and pulse several times to combine. Scrape the mixture into a glass or stainless steel mixing bowl (don’t use aluminum as the lemon juice will then taste funny). Add half and half and salt and whisk to combine. Set aside for 30 minutes, stirring every 10 minutes to allow mixture to thicken and dissolve the sugar. At this point the mixture may be sealed in an airtight container and refrigerated for up to 3 days. In any event, the mixture should cool in the refrigerator for at least 2 hours before turning it into ice cream. Freeze in an ice cream maker according to the manufacturer’s instructions. Firm in the freezer for several hours before serving. 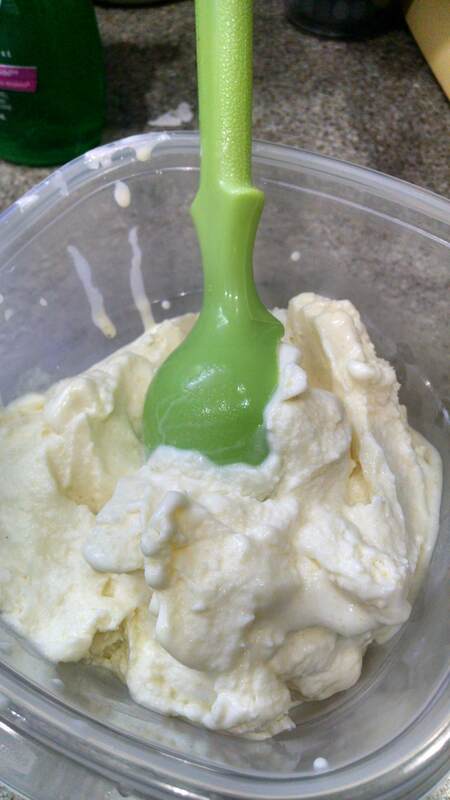 For longest lasting flavor, cover the top of the ice cream with plastic wrap placed directly on the surface. Allow to soften slightly before serving. If you ask a scientist what pi is, she’ll tell you it equals 3.14159. If you ask a mathematician, she’ll tell you pi equals the circumference of a circle divided by its diameter. But if you ask me, I’ll tell you I want another slice! If you round up pi, you get 3.1416, which coincidently is today. 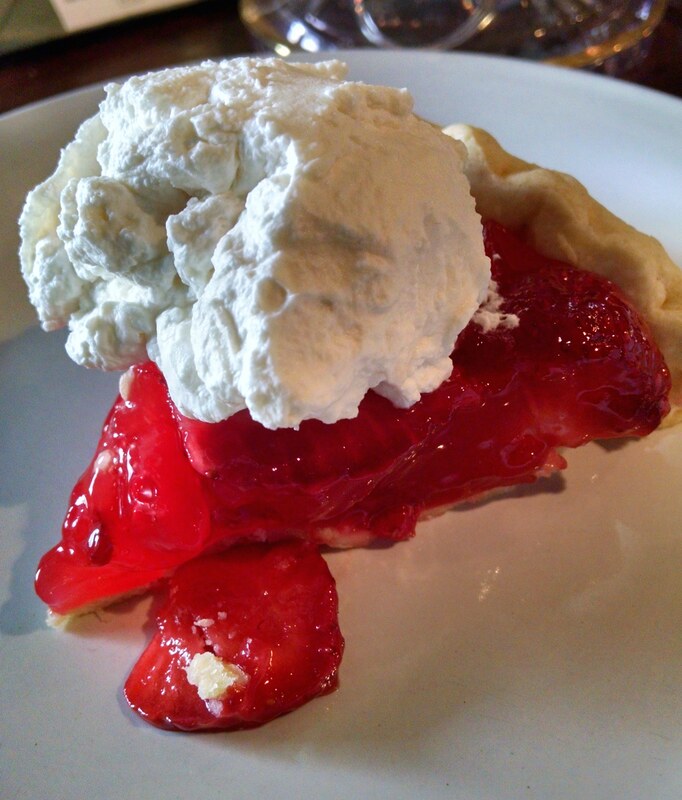 This recipe is from Michelle’s late grandmother, Nanny, and makes two pies. Trust me, it is so good and goes so fast, you’ll be glad for the extra! Brown pie crusts in the oven according to package directions, pricking the bottom with a fork before baking. Cool crusts while making filling. In a saucepan, combine sugar, water, cornstarch and salt. Cook over medium heat until mixture is clear and sugar and salt are dissolved. Remove from heat and stir in strawberry Jell-o. Add red food coloring, if desired. Divide the sliced berries between the cooled crusts. Pour cooked mixture over the berries. Refrigerate pies at least 4 hours or until well chilled. Top with whipped cream (or Cool-Whip) and serve.